Dance Overture, Op. 16a (1961) [6�36]. Divertimento, Op. 7b (1958) [11�26]. Invocation and Dance, Op. 17a (1961) [11�37]. Prelude, Aria and Finale, Op. 25b (1964) [10�39]. Sinfonietta, Op. 34c (1967) [13�10]. Laudi, Op. 62d (1973) [12�10]. Vistas, Op. 69d (1975) [13�14]. William Mathias�s love of life is the first thing that strikes the listener. This collection of shorter works from a variety of sources (see title) reveals many facets of this composer�s imagination � indeed, this could serve as the ideal introduction to Mathias� music. The exuberant Dance Overture evokes the Celtic spirit of the dance, with the LSO enjoying each and every accent. It makes the ideal opener for the disc. The Divertimento, Op. 7 of three years previous is the student work that led to a publishing contract with Oxford University Press. Of its three movements, it is the central Lento non troppo that is the most memorable. It is the English Chamber Orchestra, here, that sets up a haunting, hypnotic atmosphere (interestingly, in the Prelude, Aria and Finale for String Orchestra it is the �Aria� that is the most affecting movement). The unsettled undercurrent to the music of this Lento seems to introduce a new, deeper element, only to be banished by the Bartókian spiciness of the finale. Concurrent with the Dance Overture, the Invocation and Dance, Op. 17 is made up of the purest joy. The very opening is almost Coplandish (it sounds like the slower parts of Rodeo to me � this passage is what the composer described as �a broad-spanned summons to attention�) and indeed most of the Invocation is terrifically delicate (listen out for a beautifully-realised oboe solo). The Dance is positively bursting with energy � once again, the LSO�s virtuoso side is to the fore. The Sinfonietta was written for a youth orchestra (the Leicestershire Schools Symphony Orchestra), so it is entirely fitting that it is the 1975 National Youth Orchestra of Wales that is featured on the present recording. The influence of jazz and blues can be heard, especially in the second and third movements. Mathias�s music is so obviously suited to performance by young people that this emerges as one of the highlights of the disc. The recording is up-front and exciting. 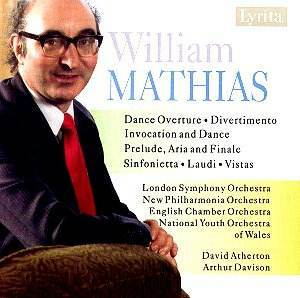 Mathias wrote a sequence of single-movement orchestral works that he described as �landscapes of the mind�. The last two offerings are instances of these �imaginary landscapes� (Helios of 1977 and Requiescat of 1978 are further examples). Laudi, in accordance with its title, concentrates on prayer and praise. The scoring is masterly � a Stravinskian influence is present that adds a most attractive (to this listener) edge to the music. Finally, Vistas of 1975. Inspired by a visit to America, the music speaks evocatively of large open expanses. Detailed and informative notes from the composer�s daughter, Rhiannon, offer an excellent guide to this delightful disc. Recommended.